On the surface, the world of Tsukuyumi used to be just like ours. Like Earth, that is. One difference, though – or at least I hope it’s a difference. Thousands of years ago, the white dragon god Tsukuyumi was trapped in the center of the moon by his brothers and sisters. There he lay, plotting, planning, until one day he broke free of his lunar prison by crashing into the Earth. The devastation was absolute. Continents shattered. Mountains crumbled. Oceans fell dry. Animals, plants, and especially humanity paid a heavy toll. And amidst all this destruction Tsukuyumi and his army of Oni warriors stand to recapture what was once theirs. However, they do not stand unopposed. Groups of heroic survivors stand against the Oni, and against each other, in the fight for Earth. The Nomads, once the crew of a US aircraft carrier that fell dry in the middle of the former ocean. The Boarlords, sentient boars and master builders of defensive structures. The Dark Seed, a swarm of gigantic insects. Kampfgruppe 03, an ancient order of dragon slayers in state of the art power armor. 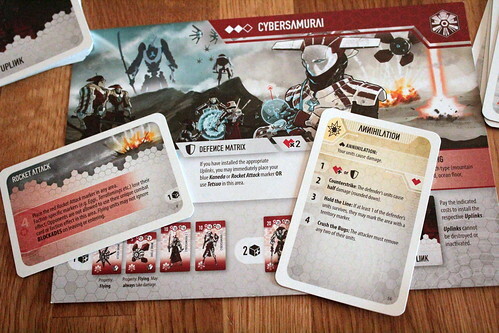 And the Cybersamurai, a computerized military force led by the AI Amaterasu. Now, tell me if you know any game with more eclectic cast. And that’s before you add the After The Moonfall expansion with its three factions. The Children of the Lion are an African clan using mutated beasts of the savanna to fight for them and changing the very game board they stand on. The Lords of the Lost Sea are a school of humpback whales making their way across the dried up Pacific Ocean looking for the water. And finally, the Fireborn are actual, fire-breathing dragons. Just in case you thought the base game was as far out as it was possible to go. Tsukuyumi is as close to a wargame as we’re likely to enjoy. The war between the various factions and Tsukuyumi’s Oni is the plot, and you can attack your opponents and destroy their units. But eliminating the opposition is not how you win the game. You do that through victory points, and you earn those mostly for completing goals and missions and for areas you control when the game ends. The end of the game happens quicker than you think, at least counting in rounds. There are only four rounds, that’s all you get. Of course, in actual time that still means two hours minimum. Each round starts with drafting your action card for the round. You start with a hand of six, pick one for the round, pass the rest to the left. The card you choose determines everything you’ll be able to do in this round’s four phases. Every player takes the actions for their white phase first, when all are done they repeat with the blue phase, the green, and finally the red. The white phase, on the back of the action card, is always the same. You pick two of four actions: draw and play an event card, produce one point worth of new units, move all your units up to one space, or execute one combat. The other three phases offer different combinations of actions on each and every card. Some omit entire phases. Some will not have the actions you need. Like every drafting game, predicting what actions you will want might be the reason why the player who passed you that hand played the card he did. Just to keep it from you. Almost surprisingly, most actions taken by themselves are rather simple. For instance, if you change the initiative by X points then you move your player order marker up or down that many spaces. Simple as that. If you draw and play X event cards then that is exactly what you do. And if your action is Move X, then you move each of your units up to X spaces. Like I said, simple. And then things get interesting, not because those next actions are more complicated but because they are different for each faction. The factions in Tsukuyumi are not just different colors of the same things, with maybe one or two distinctive units. They are entirely different from one another. And nothing makes that more obvious than the faction effect action. If you play the Nomads, then the faction effect lets you produce all your pistols to arm your soldiers for free. It also lets each of your Stuff Sergeant units place a mine, or lets all your units survive in radioactive spaces that would normally kill them. For the Boarlords, the faction effect is to terraform: build strongholds to bolster your defenses, tunnels to move quickly, or blockades to keep out enemies. And if you play Kampfgruppe 03, then you have no faction effect and this action is wasted on you. The faction effect is only the start. 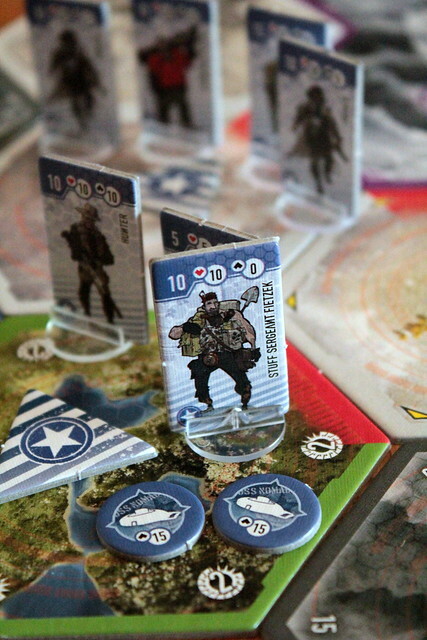 Which units you can bring onto the board with a production action is also completely dependent on your faction. For instance, the Dark Seed have weak units in general, but if an opponent doesn’t take care of them quickly he’ll find himself overrun. The Dark Seed’s Breeder and Planter unit grant their owner additional production points with every Production action. Additionally, new units can go into a space with a Planter or with an Egg, instead of only around the Dark Seed’s home zone. The swarm grows quickly if left unchecked. On the other end of the scale Kampfgruppe 03 only has five units total, but they are much beefier to start with and can all be upgraded by spending more production points on them. And if that’s not enough the Erzengel battlesuit can be equipped with a Ragnarök nuclear warhead for a few more points of production. Which leaves the one action that is more complex: Combat. To start with, there is not only one kind of combat. When you initiate combat, you play a combat card. All factions have two basic ones: Annihilation and conquest. Annihilation deals your units’ damage to opposing units in the area. The defender decides which of their units take the damage. A big, beefy unit can absorb damage to protect smaller ones and maybe not be destroyed itself. Conquest tries to take control of an area. If your units have more conquest points than the defenders you put your mark of ownership on that area. You do not destroy or drive away enemy units, however. Annihilation and conquest are different values for each unit, so you can have capable conquerors with little damage against enemy units, or vice versa. Those two values, plus the health points, are a lot of numbers to keep in mind. I really like the paper standees that put them all on the board and still look good. That’s actually the one thing I’m uncertain about with the new edition by Grey Fox Games: Miniatures look great, but you’ll always have to refer to the overview sheet for the numbers. Once more, each faction brings their own specialties to the table as well. They all have special attacks. As one example the Dark Seed can, once per round, unleash a devastating Swarm Attack and use conquest points from units in the surrounding areas. Or take the Nomads and their Guerilla Attack that conquers an area and deals damage to units at the same time. What all attacks have in common is that, unusually for this style of game, combat has perfect information. There are no dice, there are no random cards in anyone’s hand. 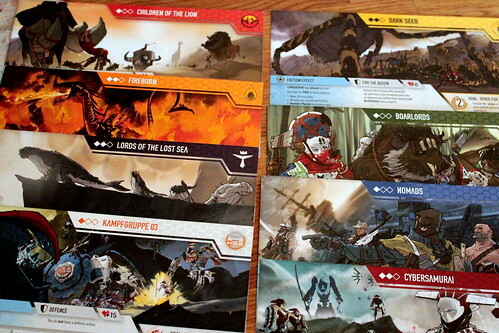 Each faction has their set of combat cards, and each combat card has options for the defender to choose their reaction from. Retreat, counterattack, that sort of thing. And again, the factions have a lot of individuality: When the combat card has the option to take a defense action, then that action is specific to the defending faction. Now, there’s one thing from the backstory we haven’t talked about yet: The Oni. They are a neutral faction who’s home base is the crashed moon. But there’s no clever mechanism to control them, that is also up to the players. 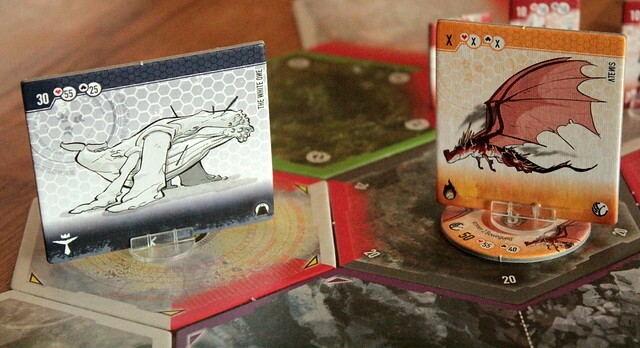 The final two actions you may find on the action cards are Placing Oni to put new Oni units on the board, and Oni conquest to move and attack with the Oni. What they conquer isn’t worth anything to you, but sending Oni against your opponents is a very useful move indeed. With all those differences between the factions, playing on a board assembled from hex tiles in different shapes, Tsukuyumi has a lot of replayability already. And yet, there’s one more thing. Each faction has a goal and a mission. The goal is for that faction to complete themselves and earn victory points when they do. The mission, however, can be completed by any player. So what scores points doesn’t depend solely on your own faction but also on which other factions are in play. With all those moving parts and things to keep in mind, it won’t surprise you that the first few games take way longer than the package says they will. And then it got worse – What does After The Moonfall add? With this heading, I don’t mean the game gets worse with the expansion. Things get worse for everyone in the game world. The first thing After The Moonfall adds we already mentioned above: Three new factions, including firebreathing dragons. Things get that kind of worse. But there’s so much more. With the new factions you have enough material to play with six players, for one. And then there’s an alternative goal for each faction. There are starting advantage cards. There are super powerful epic events and faction specific events. Especially important, there’s a mascot unit for each faction. It doesn’t do much, but keeping it alive the whole game is worth a point. There are legendary Oni, special powers for Oni, and missions to complete with the Oni. All those things are modules that you can mix and match to your heart’s desire. Just, please, play the base game first before you think about adding these. There are so many options there already, adding more from the start will pretty much drive you crazy. Short answer: This weird is not too weird. At least not for us. Tsukuyumi is about as far out as it gets, so if you’re looking for a serious setting you probably stopped reading after the first paragraph anyway. What I love is that Tsukuyumi is not one bit ashamed of its weirdness, it revels in it. There are so many generic fantasy and sci-fi settings out there, Tsukuyumi is refreshing. A second great question would be how aggressive is too aggressive. I mentioned above that Tsukuyumi is as close to a wargame as we’re likely to enjoy. For some players it’s sure to be on the other side of that line already. This is a game where you have to attack the other players, even if it’s not to destroy their units. Just how aggressive you should play depends on your faction, but you won’t finish a game without stepping on someone’s toes hard. If neither of those warnings scares you off, then let me tell you that Tsukuyumi is awesome. It’s incredibly interactive, very strategic, and the only bits of luck are in the action and event cards you get. I’m especially in love with the no luck, perfect information combat system. You know exactly what can happen when you start fighting, but you still don’t know what will happen because your opponent will make that decision. Another feature I really enjoy is the action card drafting. It has all the advantages of card drafting, balancing your options against the ones you want to take away from the next player, and then it mixes that up with action selection. However, thanks to the choices of the white phase, you can never be locked out completely from the things you want to do. Finally, I can’t say enough about the faction differences. None of the factions are even remotely similar. They are all completely unique, they need their own strategy, and their game mechanics fit with their story . 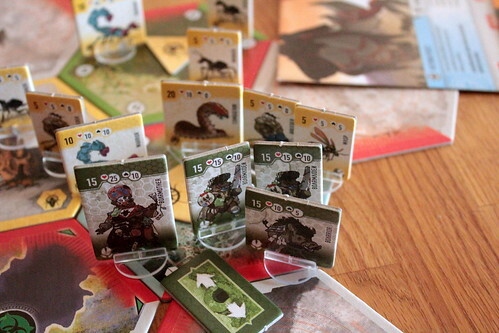 If you’re not put off by the open aggression, or by the long playing time for the first one or two games – don’t say I didn’t warn you – then Tsukuyumi is a great strategy game, and After The Moonfall only improves it. This review is based on the first edition by King Racoon Games. The new edition by Grey Fox Games will keep all the good bits, but there is one thing you should be aware of before you rush off to Kickstarter. While game and expansion have the same name, what you get in each box is different in this new edition. 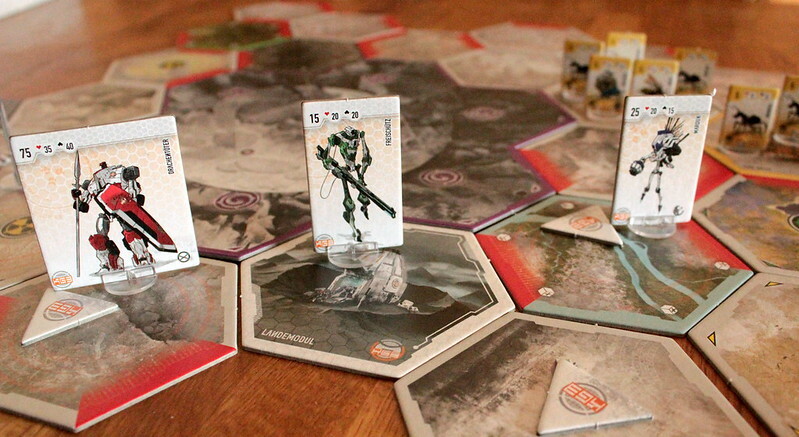 The base game now only supports four players and lost Kampfgruppe 03. To make up for that, most of the expansion modules from After The Moonfall have moved into the basic box. After The Moonfall now has the Children of the Lion and Kampfgruppe 03 factions, plus the Kickstarter exclusive Jade Sentinel. Fighting Pandas! Squeeeee! Fireborn and Lords of the Lost Sea are now add-ons you have to buy separately because their miniatures are, well, not all that mini. You’ll have to decide for yourself if those changes make this new edition better or worse than the old one, but you should be aware of them before you back.